AIA PGET is conducted by Ministry Of Ayush all over India to fill the seats available in courses of MS & MD in Ayurveda, Yoga Naturopathy, Siddha &Homeopathy. 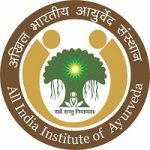 This is a national level entrance examination will be conducted by AIAA (All India Institute of Ayurveda) as announced by Ministry Of Ayush New Delhi for admission in PG courses all over India. The entrance examination is expected to be held in the month of June 2019. AIA PGET 2019 Application process will be started from 2nd week of April 2019. Candidates can Click Here to apply online. Ayurveda Samhinta, Ayurveda Siddhanta, Bhaishajya Kalpana, Agad Tantra Evun Vyavhara Ayurveda, Dravyaguna, Kriya Sharir, Kayachikitsa, Karna-Nasa Kanth-Shiro Rog, Panchkarma, Mukha & Danta Rog Vigyan, Manovigyan Evam Manas Roga, Netra Rog Vigyan, Roga Nodan & Vikriti Vigyan, Rasashastra, Rachana Sharir, Shalya Samanya, Swasthvritta, Stri Roga Evum Prasuti Tantra. Candidates must possess Provisional BAMS/ BUMS/ BSMS/ BHMS Pass Certificate recognized as per the provisions of the IMCC 1970/HCC 1973 Act. Candidates must possess a permanent or provisional registration certificate of BAMS/ BUMS/ BSMS/ BHMS/Graded BHMS degree qualification issued by the CCIM/CCH/state board/universities/deemed universities. Interested and eligible candidates have to submit the application form to appear in the examination. No application forms will be submitted through offline mode. The candidates will be able to register themselves from the official website at aiapget.com. The aspirants must provide the relevant information while registering such as contact/ address details, educational qualification details, etc. Application fee has to be paid by the candidate. The Online registration will most probably start in the month of June 2019. The eligibility criteria of the candidate will be taken into consideration. The application fee can be paid by online mode by using Debit/ Credit card or by net banking. The questions will be Multiple Choice Questions (MCQs). 1 mark will be given for the correct answer and -0.25 negative marking for the wrong answer. The related authority will release admit cards in last week of July 2108. From the official portal of authority, the candidates will get admit cards for the examination. To download admit card candidate have to fill the registration number on the portal & they will be able to get their admit card print out. Candidates also have to bring an identity proof such on the day of entrance examination. The ID Proof can be anyone from PAN card/Driving license/Voter ID/Passport/ Aadhar Card (with photograph). Candidates must produce the valid admit card at the examination center. On the basis of merit list made by the authority, admissions will be commenced. Candidates can check their result on the official site of authority. Authority will release results in August 2019. Merit list will be shared with various state universities and private universities so that they can begin the admission procedure. The state authorities and universities may have counseling sessions for admissions, otherwise, AIIA & MINISTRY OF AYUSH will not commence any counseling sessions. Management quota & NRI quota was given by private colleges is canceled by the authority from this session.